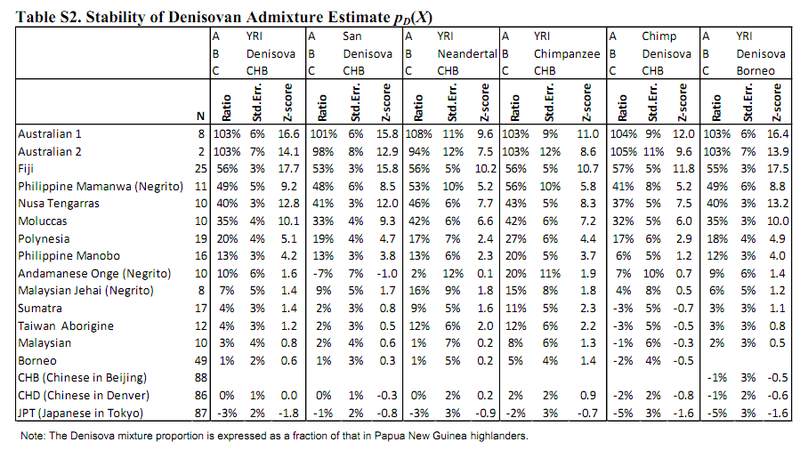 Table S2 from the paper (pdf) gives the Denisova admixture as a fraction of the Papuan New Guinea highlander Denisova admixture. It seemed almost certain to me that Australian aboriginals would register such admixture, as they have often been described, on physical anthropological grounds, as closer to Papuans than to any other human population. 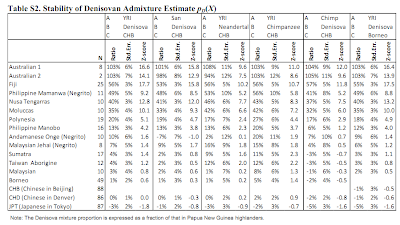 But, it is nice to see the evidence (or lack thereof) for Denisova admixture quantified in various groups described as "Negrito" or "Australoid" by traditional physical anthropology. The inference, by the authors, that Denisova admixture took place in Southeast Asia itself makes sense to me. This admixture may have been variable to begin with, but it was reduced in Southeast Asia itself as the number of modern humans in it grew, absorbing the Denisova-admixed early inhabitants, with the latest episode taking the form of the arrival of East Eurasian populations (traditional Mongoloids) that seem to lack this admixture altogether. The interesting question now seems to be: with Denisovans spread from the Altai to Southeast Asia, how did the ancestors of East Asians avoid having any? 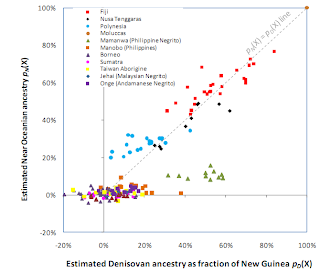 One of the most interesting findings of the paper is that the extent of Denisova admixture is strongly correlated with the extent of Near Oceanian (Australian-Papuan) admixture. You can see that 7% Denisova introgression into the ancestors of Australians/New Guineans is inferred to have been "diluted" by roughly 50-50 admixture with Denisova-deficient modern humans, leading to the ~4% figure of Denisova admixture in extant Australians/New Guineans. This was further diluted in populations like Mamanwa, by admixture with East Asians. It seems likely that inter-population differentiation within the species H. sapiens may be driven, at least in part, by admixture with archaic humans, and is not only the result of isolation post-Out of Africa. If Franz Weidenreich were alive, he would probably be smiling. Given that the Denisova hominin is about 41ka old, that would imply that East Asian ancestors moved through their territory after that date, when the Denisovans were already extinct, partially absorbed by first-wave "Australasian-like" people. We must also consider the possibility that the Denisovans themselves may have been intrusive to Siberia; could the Altai Denisovans be remnants of a Southeast Asian population that fled out of the way of the modern humans that migrated to Australasia? If that is the case, then East Asian ancestors may lack Denisovan admixture because they had already reached the far east when Denisovans started moving north. I, for one, can't wait until we start getting ancient DNA from Upper Paleolithic H. sapiens, who knows what new surprises are in store for us? "the data can be most parsimoniously explained if the Denisova gene flow occurred in Southeast Asia itself. Thus, archaic Denisovans must have lived over an extraordinarily broad geographic and ecological range, from Siberia to tropical Asia". "It seems likely that inter-population differentiation within the species H. sapiens may be driven, at least in part, by admixture with archaic humans, and is not only the result of isolation post-Out of Africa". "Stoneking says that this pattern hints at at least two waves of human migration into Asia"
Besides which haplogroups hint at two separate routes into Asia: one via South Asia (Y-hap F and mtDNA M) and one via the Denisova homeland (Y-hap C and mtDNA N). The latter pairing is certainly prominent in Australia although not so in New Guinea. However we know that haplogroups are not necessarily strongly connected to aDNA. Yeah, I am not so hot on the idea that archaic humans in SE Asia where identical to Denisovans. I'd think of the former as old Asian erectus, and the latter more heidelbergensis-like. We definitely need to look for the possibility of yet another archaic signature in East Asians. Likewise, I think it is too fast to conclude that there was only one ooA just based on roughly similar Neanderthal admixture. At any rate, in conjunction with the new aborigines data of the paper above, it seems clear that there were two waves and - if one believes the dates - the Australian/New Guinea one was cut off during Toba supereruption, but then partially re-united with another extreme SE Asian branch before 50,000 ya. Now, this I do believe must have happened in situ. At any rate, it is good to see some much more reasonable dates being discussed - although the Euro-Asian split date is of course a joke. Inter-population diversity is highest in the Americas, followed by Papua New Guinea ("The proportion of genetic variation among all studied African populations was 1.71% (table S3). In comparison, Native American and Oceanic populations showed the greatest proportion of genetic variation among populations (8.36% and 4.59%, respectively)" (Tishkoff 2009)). There were no archaic hominids in the New World. hence, the argument is flawed. "We have the possibility that East Asians derive from an as yet undiscovered 'archaic' population"
We also have the possibility that East Asians are derived from American Indians. At least, American Indians are real, while your undiscovered archaic populations are imaginary. There were no archaic hominids in the New World. hence, the argument is flawed. Learn to read: ""It seems likely that inter-population differentiation within the species H. sapiens may be driven, at least in part, by admixture with archaic humans"
A consequence of variable levels of European admixture + extreme genetic drift in some Amerindian populations. "Learn to read: ""It seems likely that inter-population differentiation within the species H. sapiens may be driven, at least in part, by admixture with archaic humans"
Learn to think: if your principle of archaic admixture doesn't not apply to the area with the highest inter-population diversity but instead, according to you, the highest diversity values in that very area are driven by European admixture and drift, then your thinking is doubly flawed. If Amerindian diversity can be explain through greater drift than in the Old World, then you can just assume that in the Old World there was less drift. You don't need archaic admixture. If you're going with the admixture scenario then you're putting the cart before the horse: you should first sort out the effects of drift and within-Homo sapiens admixture processes (European, Neolithic, etc.) and only then invoke archaic "admixture". "A consequence of variable levels of European admixture + extreme genetic drift in some Amerindian populations." Drift and great age! Look at linguistics with 2/3 of worldwide language diversity in the Americas for cross-checking. All historically attested Amerindian haplogroups are also attested in ancient remains all over America, hence European admixture doesn't change a thing. Plus did Amerindians lose their Denisovan admixture collected from an Old World source through drift to acquire their archaic-admixture-free Fst? If Amerindian diversity can be explain through greater drift than in the Old World, then you can just assume that in the Old World there was less drift. You don't need archaic admixture. There is no question of "need". Archaic admixture in the Old World is a fact, proven by the different affiliation of Old World populations to at least two archaic hominins. Look at linguistics with 2/3 of worldwide language diversity in the Americas for cross-checking. The Caucasus is one of the areas of Eurasia with the highest linguistic diversity, but as was shown in the recent Yunusbayev et al. paper, its population is fairly homogeneous in the Eurasian context. Only a fool would derive the origin of humans based on linguistic diversity, as linguistic diversity expands at a timescale of millennia, while modern humans have been around for 1-2 orders of magnitude longer than the oldest attested language family (depending on one's definition of modern). Amerindians (and most Eurasians) don't have Denisovan admixture. Near Oceanians and Near Oceanian-admixed populations do. "Archaic admixture in the Old World is a fact, proven by the different affiliation of Old World populations to at least two archaic hominins." Nobody proved anything. It's a mess. There's no corresponding archaic DNA attestations in Africa. Whatever matchups were found could be common descent and not admixture. It explains why non-Africans are equally Neanderthal. One of your pictures "admixture graph" can be read as common descent outside of Africa, admixture in Africa, or common descent in Africa, admixture outside of AFrica. Language diversity is greater not on the Yoruba pole of things bit on Australian/New Guinean pole of things, which is closer to Denisovans/Neandertals. "The Caucasus is one of the areas of Eurasia with the highest linguistic diversity, but as was shown in the recent Yunusbayev et al. paper, its population is fairly homogeneous in the Eurasian context." So, genetic homogeneity is not a sign of recency. Works for the Caucasus, works for America, works for Papua New Guinea (all ancient refugias with lots of selective constraints that drive genetic diversity down but doesn't affect languages), works for Neandertals (no data on languages). "Only a fool would derive the origin of humans based on linguistic diversity, as linguistic diversity expands at a timescale of millennia, while modern humans have been around for 1-2 orders of magnitude longer than the oldest attested language family (depending on one's definition of modern)." Only a fool will blog profusely about MODERN Human origins without an in-depth knowledge of the diversity in the form of expression of the language capacity. If you look in Suppl Mat you'll see that even according to Atkinson the second best fit for homeland is South America. I'd be curious to see how much the genetic distinctiveness of non-African populations from each other is reduced (by measures like FsT) if Denisovian genes are removed from the sample. Necessarily, it has to make the distance smaller and probably it has the greatest effect in a trimming of the extremes. Non-African genetic diversity is small as it is, but parsing out this component would make it even smaller. I'd also be curious if one could make inferences about effective Denisovian population size from the residual Denisovian genome composition. This would also measurably reduce the estimated effective population size of proto-non-African population (with the caveat that it is still hard to do estimate effective population size estimates in multiple waves models where different waves have different degrees of demographic impact that seem to be the best reflection of reality). Still, a wave one with archaic admixture model and one or more later waves without admixture model combined with a little Baysean expectation placing of parameters based on ethnographic data ought to give us a much better handle on the absolute numbers of people were are talking about in these key stages of prehistory than we have today. If you assume that proto-non-Africans were admixted with Neanderthals prior to that community's fission, you also can estimate the pre-Neanderthal admixture effective size of that proto-population (and the Neanderthal admixing population) more or less independently once you've determined the size of the post-Neanderthal admixture effective population size. As far as a narrative goes, a three wave model could fit the data perhaps better than the two wave model suggested. In a three wave model, for example, would be a better fit if the Australian aboriginal population lacks Denisovian admixture. - wave one (probably associated with Y-DNA haplogroup D), arrives, may or may not admix with archaics in each given region. The archaics are wiped out, exiled to Siberia, or vastly diluted on the mainland of Eurasia but survive in relict Indonesian island chain populations that wave one humans do not reach. A relict archaic population doesn't make it to Australia. - wave two, the Papuan/Australian aborgine wave, arrives next and and is largely wipes out or replaces wave one except for relict populations. Papuans admix with the relict archaic population, while other populations have no archaics or only wave one people with highly diluted archaics to admix with. 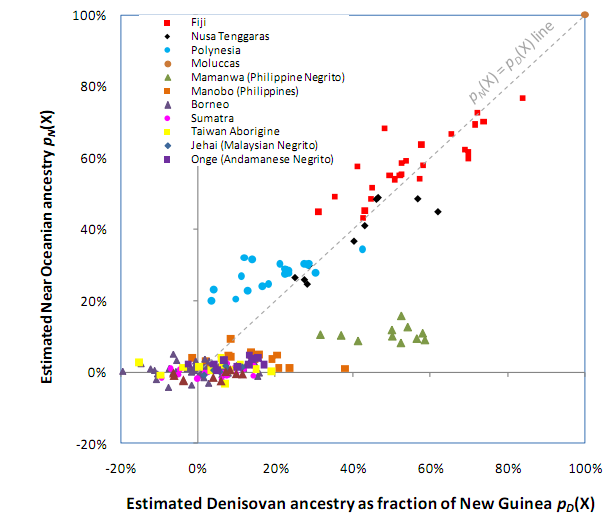 Note that genetic evidence to date pretty definitively shows that Papua New Guinea and Australia had distinct settler populations with Papuans probably not descended from Austrlians or visa versa although they may have had a common source population in SE Asia. Despite the existence of a land bridge for an extended period and a not very difficult to navigate island chain bridge after that, the two populations appear to have been isolated genetically from each other from very early on and the non-genetic data largely concur. - wave three (Upper Paleolithic, post-Melanesian/Australian) arrives having a huge demographic impact relative to wave two although not effecting nearly so complete a replacement as the combined impact of wave two and wave three on wave one and the archaics. "I am not so hot on the idea that archaic humans in SE Asia where identical to Denisovans". To me it makes no sense at all that they would be the same. "I'd think of the former as old Asian erectus, and the latter more heidelbergensis-like". "We definitely need to look for the possibility of yet another archaic signature in East Asians". Absolutely. Some region was the source of the 'East Asian' phenotype. To claim that it developed in SE Asia and became more extreme as people moved north makes no sense at all. "Note that genetic evidence to date pretty definitively shows that Papua New Guinea and Australia had distinct settler populations with Papuans probably not descended from Austrlians or visa versa"
Yes. 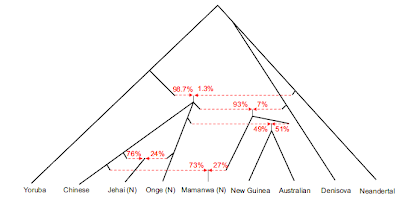 Papua is mostly Y-hap K and mtDNA M while Australia is largely Y-hap C and mtDNA N. Suggests separate migrations to the New Guinea/Australia region. And also raises difficulties for your three wave model. "wave one (probably associated with Y-DNA haplogroup D), arrives, may or may not admix with archaics in each given region". Except in the Andamans Y-hap D is very much associated with the East Asian phenotype. If that phenotype is an archaic survival then Y-hap D must have mixed with it eventually. Y-hap C3 is also very much associated with the East Asian phenotype, as is mtDNA A and the northern Cs and Ds. "As far as a narrative goes, a three wave model could fit the data perhaps better than the two wave model suggested". A single wave fits the data if we accept a separation at the Hindu Kush. One branch went eastward to the north of the Himalayas and one went to the south of the mountains. Eventually a combination from SE Asia moved both north through East Asia and back west through South Asia and into Africa and Europe. Fits the haplogroup distribution perfectly. It just lacks absolutely supporting archeological evidence. "Except in the Andamans Y-hap D is very much associated with the East Asian phenotype." No. 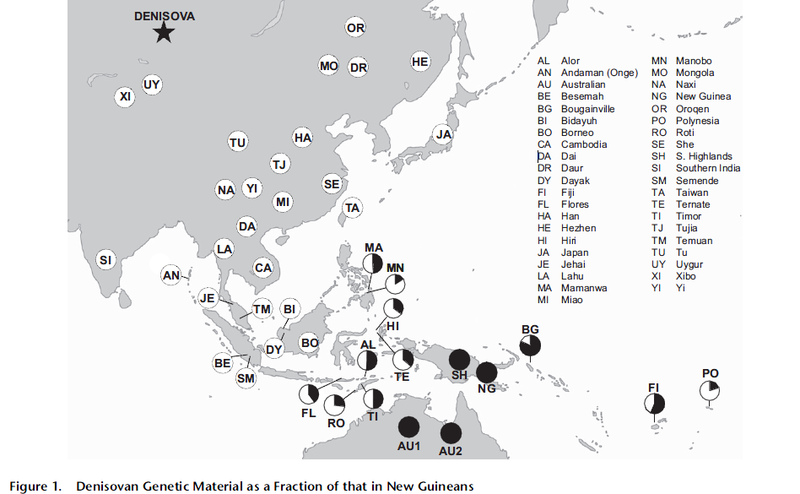 Besides the Andamans, Y-DNA hg D is found among the Ainu and they are a non-Mongoloid island in Northeast Asia. It seems clear that Y-DNA hg D has a pre-Mongoloid signature in Asia. Andrew’s-wave theory almost entirely agrees with my own, especially as regards their being 3 waves and the distinctness of Papuans and Australians in recent times. My main disagreement is in regarding the first wave (D males and M, D or Q females) as stronger in New Guinea and, to a lesser extent, Australia at first. Later, I believe the D males were killed off by males of the other groups, who took their women. Also, wave 3 doesn’t seem to have replaced wave 2 in Australia as much as Andrew thinks, since it seems that the male C and female N are still common, if not more common in Australia are male K and female P, while New Guinea are male K and M and female Q and P, and I am supposing that Q came in with wave 1 (with D males who were later killed), while wave 2 had C males and N females, and wave 3 had K males (who later gave rise to M) and P females. "Besides the Andamans, Y-DNA hg D is found among the Ainu and they are a non-Mongoloid island in Northeast Asia. It seems clear that Y-DNA hg D has a pre-Mongoloid signature in Asia". Sorry. I forgot about the Ainu. As I understand the situation Japanese D is D2. D1 and D3 are very much associated with the East Asian phenotype though. "My main disagreement is in regarding the first wave (D males and M, D or Q females) as stronger in New Guinea and, to a lesser extent, Australia at first. Later, I believe the D males were killed off by males of the other groups, who took their women". But there is no trace of D anywhere near Australia or New Guinea. Once you begin to postulate that 'males were killed off by males of the other groups, who took their women' it's possible to argue almost any scenario. To me it is far more likely that D never got close to Wallace's Line. "Also, wave 3 doesn’t seem to have replaced wave 2 in Australia as much as Andrew thinks, since it seems that the male C and female N are still common, if not more common in Australia"
Yes. And the distribution suggests to me that these two haplogroups were the first across Wallace's Line. "I am supposing that Q came in with wave 1 (with D males who were later killed)"
could quite easily have come in with Y-hap K, a second movement across Wallace's Line. Some of this second wave also reached Northern Australia. Australian M14, M15 and M42 may also be associated with this lot. "wave 3 had K males (who later gave rise to M) and P females". Wave 3 across Wallace's line reached way into the Pacific, and consisted of mtDNA B4a and Y-haps C2 and O3a. Q and the local branches of female M is unlikely to have come in with male K, since M and Q are mostly southern lineages (M heading north only at the east coast of Asia), while the male K probably comes from the north along with male M, since M's closest relatives in the NOP group, and while other branches of K (the ones that gave rise to L and T) may have been southern, the branch that gave rise to M probably came from the north. In any case, K and M are part of the 3rd wave on the 3-wave model. It is a huge one, giving rise to Caucasoids and much if not most of the Mongoloids and Amerinds. The K-M migration is just one branch, which arrived long before the Mongoloids more south and into the Pacific. Now as to the Denisovan admixture, I had supposed that maybe Denisovans mixed only with 1 or 2 waves, but the difference maybe more geographical than a matter of which we wave it is: perhaps those of branches of each wave that arrived in Southeast Asia early were the ones that mixed with Denisovans. "the male K probably comes from the north"
Unlikely. As you say K is part of MNOPS, which is part of F. F is almost totally confined to South Asia so MNOPS presumably entered the east via that region. M and S are both New Guinea haplogroups and presumably originated there or very nearby. That implies that NO and P did too. SE Asia seems the most likely place of origin for that set of haplogroups. Q's and its relation R look to have spread back through South Asia to emerge into Central Asia. Where R1b moved west, Q moved east and R1a stayed roughly in between. That makes your claim, 'the branch that gave rise to M probably came from the north' unlikely. "M heading north only at the east coast of Asia"
Again, if you're talking about mtDNA, that doesn't seem likely. Haplogroups such as M8/CZ, D and M12'G appear to have moved north from Northeast India via some inland route. Some Ms are SE Asian but the main coastal movement for M in East Asia seems later, from the north. The distribution of R-derived haplogroups on the other hand does indicate a coastal movement north. "In any case, K and M are part of the 3rd wave on the 3-wave model. It is a huge one, giving rise to Caucasoids and much if not most of the Mongoloids and Amerinds". True. But that third wave most likely originated somewhere near SE Asia and involved R-derived mtDNA haplogroups as well as NO and P Y-haps. "perhaps those of branches of each wave that arrived in Southeast Asia early were the ones that mixed with Denisovans". It's doubtful that anyone directly picked up Denisovan genes in SE Asia. Just from a secondary source, from people who had earlier picked them up and carried them there. It is unlikely that most of the MNOPS originated in the south, since most of them, especially the big ones, are found in the north, and so it is more parsimonious to suppose that they branched off from F and K in the north and only a few (a branch of K and M and the tiny S) went to Australasia than to suppose that they all branched off in the south and then most of them went far to the north. As to female M, it seems to have originated in the south, and so it must later have moved north (even though, after moving inland in East Asia, some again went south). In general, the evidence of phenotypes makes it likely that the 3rd wave originated to the north of the other 2, since the phenotypes associated with it (Caucasoid, Amerind and Mongoloid) are adaptations to cooler climate than those associated with the other 2 (Negroid and Australoid) (though Caucasoid is still an adaptation to a climate that is moderately warm, and also dry, and so probably originated in SW Asia). So, until strong evidence from genetics to the contrary turns up, it seems likely that the haplotypes associated with wave 3 (those descended from male F and those descended from female N, including the many descended from R)also originated mainly in the north (even if it turns out the very oldest of these, male F and K and female N and R, originated in the south). "it is more parsimonious to suppose that they branched off from F and K in the north and only a few (a branch of K and M and the tiny S) went to Australasia than to suppose that they all branched off in the south and then most of them went far to the north". I disagree completely. It is most parsimonious to place the origin in SE Asia. You can hardly describe either M or S as 'tiny'. The two haplogroups make up by far the majority of Y-haps in New Guinea. It is extremely unlikely that both M and S could have moved from anywhere 'in the north' all the way to New Guinea leaving no trace behind. On the other hand descendants of NO and P are spread all the way from SE Asia north (in the case of NO) and west (in the case of R). "As to female M, it seems to have originated in the south, and so it must later have moved north (even though, after moving inland in East Asia, some again went south)". I'm very much inclined to agree with that. To me it seems most likely that M had its greatest diversity (although probably not its 'origin') in the border region between Northeast India, South China and Burma. It seems to then split into three strands as it spread overland from there: north through inland China (D, M7, M8/CZ, M12'G etc. ), south along the Malay Peninsula (the Australo-Melanesian haplogroups along with M17, M47 etc.) and directly east into Laos and Vietnam. That seems to comprise the second wave into East Asia. "the evidence of phenotypes makes it likely that the 3rd wave originated to the north"
True. It carried speakers of various East Asian languages into South China, SE Asia and beyond. But this 3rd wave carried just the Mongoloid phenotype south, where that phenotype mixed with pre-existing phenotypes. 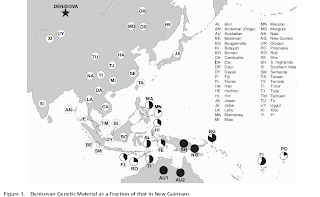 "though Caucasoid is still an adaptation to a climate that is moderately warm, and also dry, and so probably originated in SW Asia"
One of the phenotypes present in SE Asia at some stage, although now confined to Australia. To me the haplogroup evidence suggests this was the first wave (Y-hap C and mtDNA N) and it carried the Denisova phenotype through Central Asia, by some as yet unknown route, then down the east coast of Eurasia. "the haplotypes associated with wave 3 (those descended from male F and those descended from female N, including the many descended from R)also originated mainly in the north"
The southeaster tail of the third wave (that moved into the Pacific) comprises mostly various Y-hap Os (from the north) and Y-hap C2 (from Southern Wallacea) along with mtDNA B4a (from SE Asia). A few New Guinea/Melanesian haplogroups joined in. To me the most likely scenario concerning mtDNA R is that it originated somewhere along the South Chinese coast or even in Vietnam. Members of the haplogroup joined up with Y-haps NO and P and off they went. Otherwise, the northern route for the 3rd migration still seems to have the advantage. It is more parsimonious to suppose that the ancestors of Europeans came from Africa by way of Southwest Asia and Central Asia than to suppose that they went all the way to Australasia and the made the long trip back. And this fits better with the picture of the gradual passage through phenotypes from Negroid through Caucasoid to Amerind to Mongoloid, by gradually movement northward from Africa through Western Eurasia into cooler and cooler climates, followed by migration eastward (which in European Russia can move you into cold climates), which is suggested by the current distribution of these phenotypes. Furthermore, there is some reason to believe that L came to India from the Central Asia and so probably LT did too, which further increase the number of descendants of K that originated in or are still living north of the Himalayas. Finally, C would part of the 2nd migration, not the 3rd. "I should have said that only K came from the north to New Guinea, where it gave rise to M and S". "That there are no traces of M up north is troubling, but could be explained by saying that the various branches that budded off the 3rd migration were each so small that that the ancestral M either became extinct or individuals bearing it were never included in the branch"
Isn't it most likely to show that MNOPS spread from somewhere very near New Guinea? Perhaps from Wallacea? No need to come up with any other explanation. "the northern route for the 3rd migration still seems to have the advantage". I'll try to explain why not. "It is more parsimonious to suppose that the ancestors of Europeans came from Africa by way of Southwest Asia and Central Asia than to suppose that they went all the way to Australasia and the made the long trip back". I agree it is more parsimonious. But such a doubling back of Y-hap R and mtDNA R appears to best fit the haplogroup evidence. Anyway, not from as far east as 'Australasia'. More like mainland SE Asia, or perhaps Wallacea. "this fits better with the picture of the gradual passage through phenotypes from Negroid through Caucasoid to Amerind to Mongoloid, by gradually movement northward from Africa through Western Eurasia into cooler and cooler climates"
It seems most likely that the cline between Caucasoid and Mongoloid is a product of admixture rather than common origin though. However it seems to me as though Y-hap C and mtDNA N followed much the route you suggest. "there is some reason to believe that L came to India from the Central Asia and so probably LT did too"
Quite possibly. For example I'm sure that IJK coalesced somewhere around Iran/Anatolia, and then K moved east into South Asia with F(xG), dropping off LT along the way. "Finally, C would part of the 2nd migration, not the 3rd". C is very common in Australia and I suspect it is the oldest surviving haplogroup there. As I said above I believe it reached East Eurasia via Central Asia, then moved down the coastline to Australia. That would make it the first migration, and carrier of the 'Denisova gene'. So: first wave Y-hap C and mt-N east through Central Asia and down to Australia. Second wave F and K east through India and out to New Guinea. Third wave Y-hap MNOPS and mtDNA R from SE Asia.